Marjorie Bradley Kellogg is an award-winning Broadway set designer in New York City. She also designs for film and television and teaches design at Colgate University. 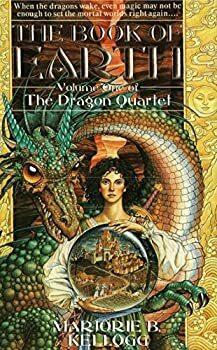 The Dragon Quartet — (1995-2003) Publisher: Here’s an exciting fantasy tetralogy with all the right ingredients: four elemental dragons (Earth, Air, Fire, and Water), each with a human companion. This series takes us from medieval Europe to the distant future, as the world is caught in a war between the forces of greed and fanaticism on the one hand, and the dragons and their guides and allies who seek to restore the proper natural balance to the planet on the other. Erde, the daughter of a German noble, is suddenly and terribly thrust into a world of magic and fear when she is accused of a crime she did not commit. After fleeing her father’s wrath and the insane ravings of a power-hungry priest, Erde heads into the mountains to be joined by a small, clumsy, surprisingly un-fantastic dragon named Earth.